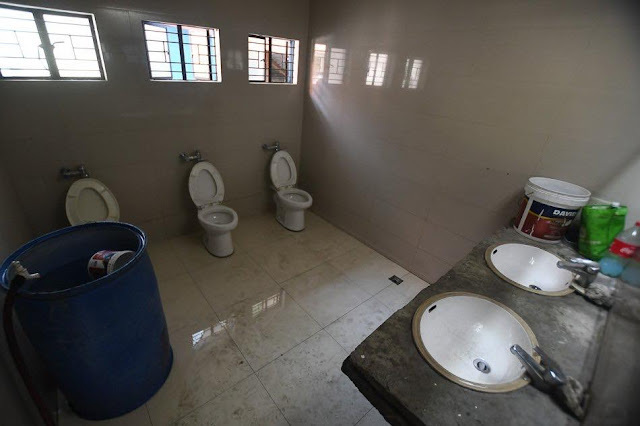 MANILA, Philippines — The Commission on Audit reported that a toilet facilities improvement project, which included the "weird" comfort room facilities whose photos were recently widely shared on the internet, cost the government more than P295 million. In the past days, a photo of a restroom at a station of the Philippine National Railways which had three unpartitioned toilet bowls has been widely circulated on social networks and talked about among Filipino internet users. According to the Department of Transportation, the restroom was part of the "Kayo and Boss Ko Toilet Facilities Improvement Project" which was launched during the previous administration. It has since been discontinued, according to the transportation department which released its statement on a social network. According to a 2017 COA report, the project was "uncompleted" and its contruction materials "unaccounted." It had a total cost of P295.857 million, according to the audit report. "No inventory report on used and unused construction materials was provided to COA" despite its recommendation for the concerned offices to issue guidelines and reporting requirements for used and unused construction materials, the audit agency said. COA also noted that only four of the 45 memorandums of agreement entered into by the DOTr had been signed by various end-users of the project as of Feb. 22, 2018. The remaining MOAs remained unacted by the parties, COA said. The audit body added that only two of the four MOAs had funds transferred to the implementing partners. COA suggested an independent investigation and the filing of legal actions agaisnt DOTr officials responsible for the lapses in procurement and project management which may have led to wastage of state funds.